← From Russia: The Economy Egg Meter! The world was making Draniki (potato pancakes) before Russia had potatoes, but Russians still think that they have the best Draniki. It seems that Belarus had potatoes about 75 years before Russia did and Draniki is the national food of Belarus, so for this article we will give Belarus the claim for this recipe. 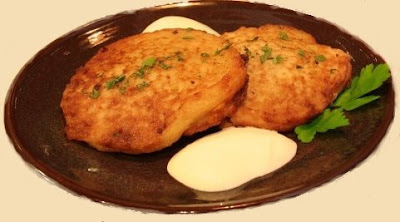 There are many other names for potato pancakes all over the world – latkes, deruny, reiberdatschi, kartoffelpuffer, rårakor, raggmunk, gamjajeon, rösti, boxty and papas rellenas are to name a few. Peel the potatoes and grate them, add sour milk, eggs, salt (to taste) and mix everything. Scoop a mass of potato mixture and carefully lay in the hot oiled skillet. Keep separated from each other (each pancake no more then 10 cm or 4″ in diameter). Cook until crisp and browned, then turn on the other side.